Motormax is really easy bait. Anyone can buy a Motormax model for $10 at your local Walmart, come home and tear it to shreds for its inaccuracies or poor quality and then suggest how you should spend $10 more for a Bburago or Maisto cast. Motormax seems keen to fix that problem, however, by taking their newer casts in a completely different direction: sacrificing play features and enhancing attention to detail. This is good and bad for many reasons. Aesthetically, this cast is pretty much a 10, which is surprising for the brand in question. Fit and finish is excellent, there are no disgusting panel gaps and no ugly plastic pieces or painted metal masquerading as head or tail lights. Details from the tiny ZL-1 badges on the hood to the Michigan license plate in the back are spot-on, even the interior is pretty well done for its scale, complete with a detailed tiny infotainment screen displaying an Apple CarPlay home screen. But then I tried to open the hood to take a look at that mighty LT4 engine, and to my surprise...there was no hood to open. I went to turn the wheels to see how that functioned, and to my surprise...there was no wheel-turning feature. The trunk test also followed suit. I was aghast to find that this model was mostly a molded plastic hunk, sans doors. Now, I’m not necessarily going to count that against it, because it’s a method that really works well when it comes to detailing, and resin casts seem to be popular judging by the 1:18 community. But, I can’t help but feel that there’s a bit of charm lost with this process. I like to see detailing under the hood, I like to be able to turn wheels for photo purposes. That’s where I don’t like this, but it gives Motormax a new ace in attention to detail...but at what cost? Like I said, overall, this isn’t a bad model at all, in fact I’d say it’s one of Motormax’s best. I just don’t like the sacrifices being made for accuracy...there’s a way to do both at the same time and win in the end, just look at how Welly does it. I’d give this a solid 6/10, it could get much more if such sacrifices aren’t made, but I won’t lose sleep over it. 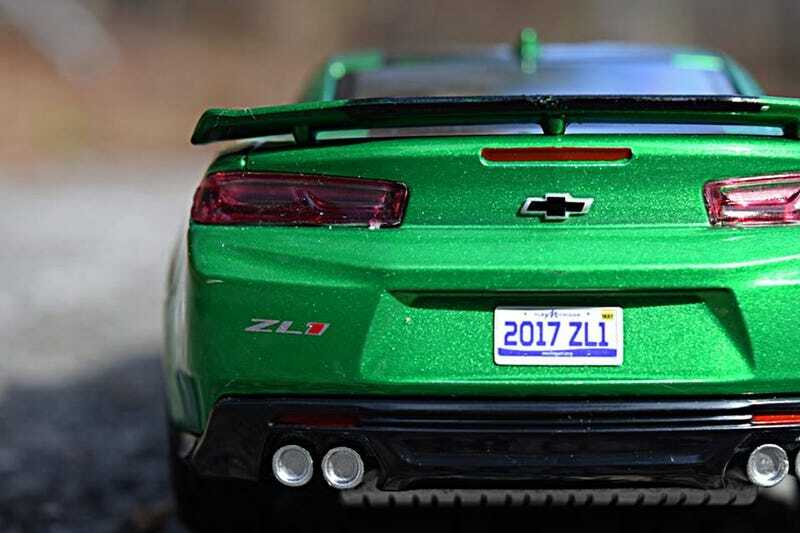 If you’re a Camaro fan looking for a cheap cast to add to your collection, you’ll be very happy.